Writer's Workshop is one of my favorite things to teach my first graders. 5 years ago, I would have never said that. But after traveling to NYC to go to Teacher's College, Reading and Writing Project at Columbia University with Lucy Calkins, I now love it just as much as reading. Here are some tips to help you get started and love it too! In the summer of 2012, my district gave me the opportunity to go to TCRWP in NYC to learn from the best of the best when it comes to Writer's Workshop. 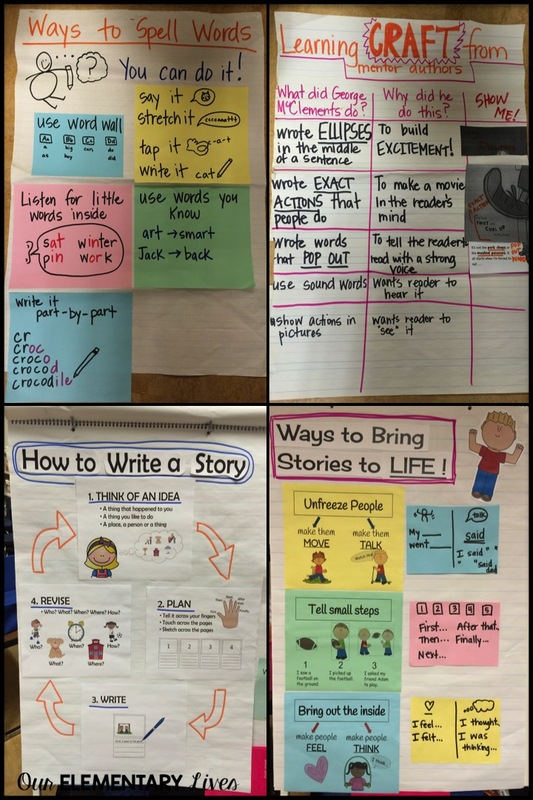 Lucy Calkins, author of Units of Study for Writing (and Reading too), is the writer's workshop guru, the master of getting kids to be writers. Needless to say, it was an incredible experience. 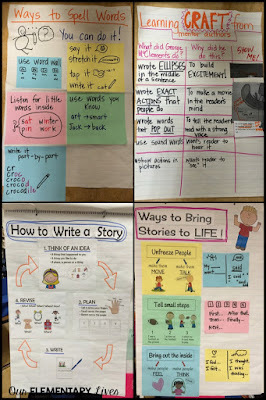 While there, I learned so much, but one of the most valuable things were these tips to get writer's workshop up and running in my classroom from Brianna Friedman-Parlitisis, one of the staff developers. I left there feeling empowered to get it started, one of the hardest tasks. 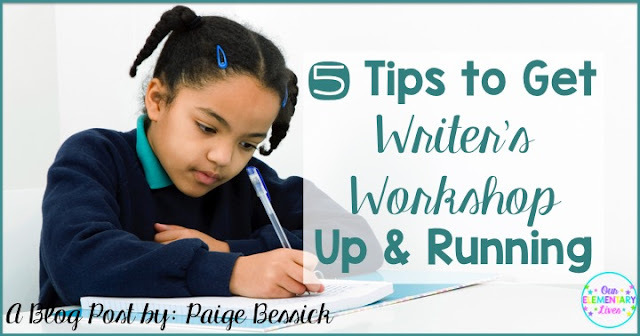 So here, we go: 5 No-Fail Tips to Get Writer's Workshop Up and Running. A writing center is a center for writing materials. It should have all the materials students need to write. Don't be afraid to let them staple, paper clip, date stamp and determine their own paper needs. 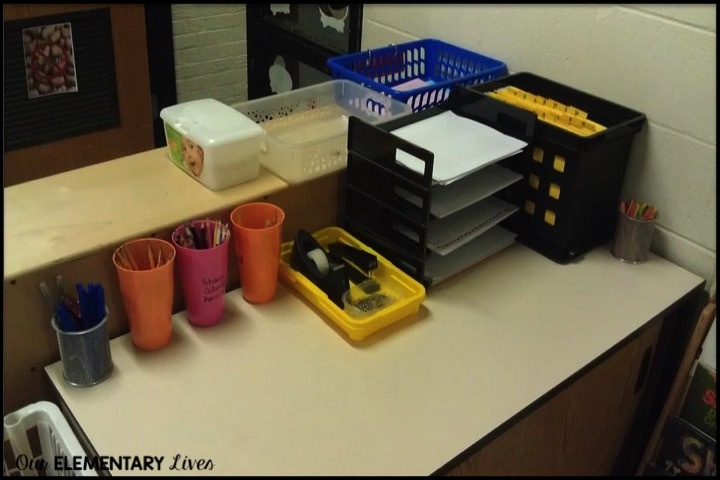 It should have several paper choices that change over time and include multiple options for all the student needs in your classroom. Stapled booklets should also be included. Make it totally independent and teach them the expectations and how to use all of the materials. 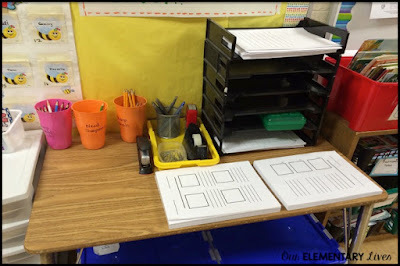 Here are two writing centers I have had in my classroom. My students bring their writing folder to the carpet for the minilesson every day. Then they take it folder to their writing spot and use it during independent writing. 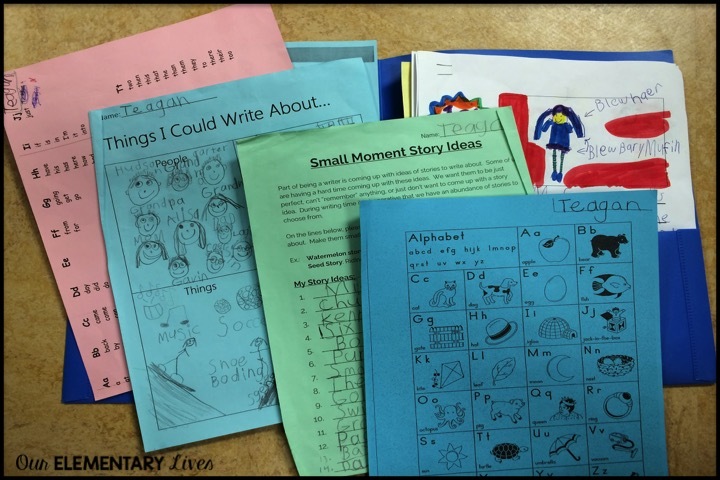 It is important for them to have the tools they need to support their writing. You will want to include things like word lists, mini-charts and writing ideas. After each unit we clean out our folders. I typically keep 3 of their pieces: their first and last piece from the unit and their published piece. I use the first and last for grading and to see how they have grown. The published piece I usually display in the classroom and then send home at the end of the year. 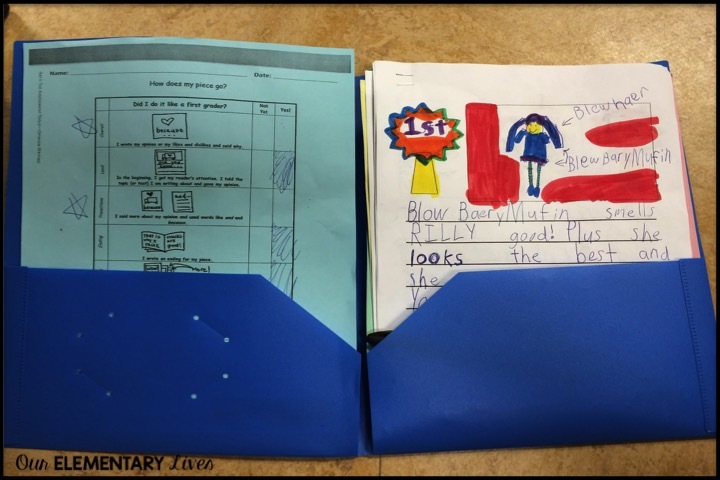 As a teacher, I have my own writing folder for each unit that I use each year and add to. In this folder I keep any anchor charts, writing pieces of my own and student samples. I also keep mentor texts and exemplar pieces. I LOVE anchor charts. I love making them and I love teaching my students how to use them. They are so important to have when teaching writing. They are used to engage and lead students towards independence. 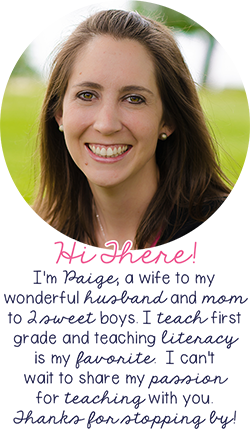 It is so important to make them visually appealing and appropriate for your grade level. If you have younger students, use more pictures. If you have older students, it's ok to use more text. They can and should be added to and changed to grow with your students. If you're not using it, take it down. Wall space is valuable real estate in my room and I don't need anything up that we're not using. Another big tip is to create it with the class as you teach. Each class will need different examples so you probably won't be able to use the same ones each year. But that's ok, because if you make them as you go, your students can help and they will be more likely to use them. 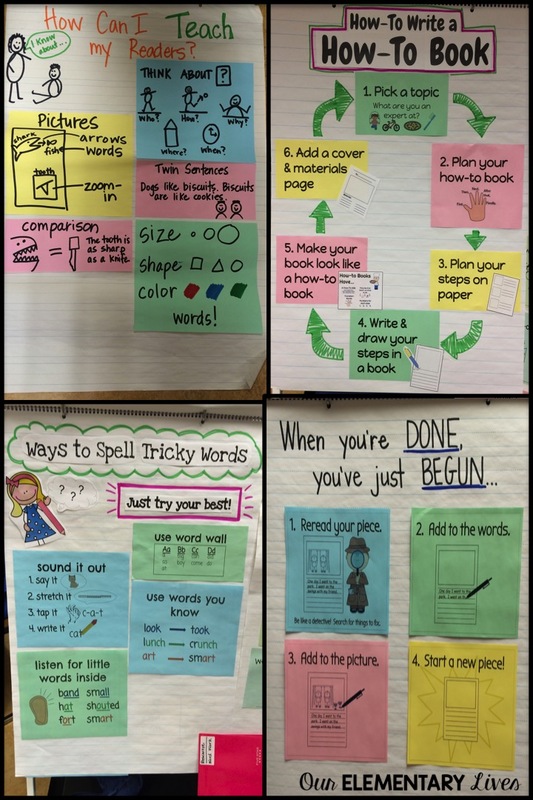 Keep reading to learn about some great tools to use for making anchor charts. 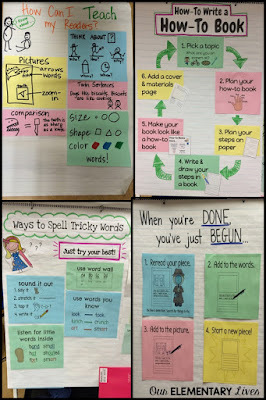 Several of the anchor charts in my classroom for different writing units. Yes, you read the correctly. PENS! 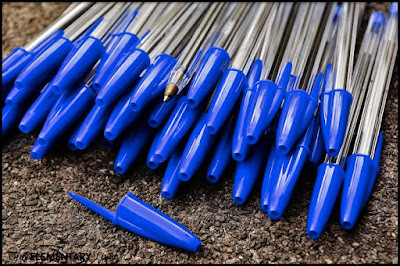 Don't be afraid to let students use pens. It makes writing special and the kids love it! 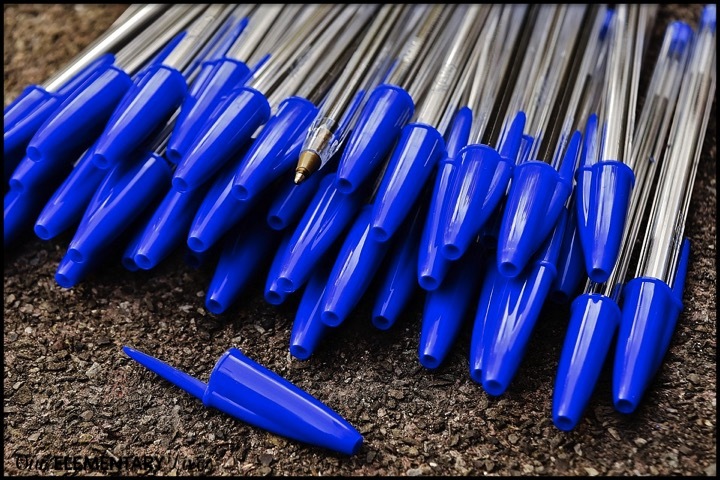 Using pens allows for you to see your students' thoughts and avoids all of the erasing. You may have lots of cross outs, but I use that as a teaching point. And you know you will have that student who really just prefers using a pencil and that's fine. But in my 5 years of using pens, I have only had 2 that I can think of that really wanted to use a pencil. And of course, I let them. Picture this: you have a student sitting for most of their writing time because they "can't think of anything to write." We have all had them and they can be pretty frustrating. A parking lot is a place where you write ideas of things students can write about. Whether it's something that happened as a class or a topic you're studying, you can always send a student to the parking lot to get an idea. I always make a big deal about it too. "Oh, you can't think of anything to write? You're SOOOO lucky! You get to pick something from the parking lot!" They usually come up with something to write about pretty quickly. I had to add this in because it is so important. This is the time for students to write their own books and to be authors. I make a really big deal about being authors. It's also important to make publishing and celebrations a priority. 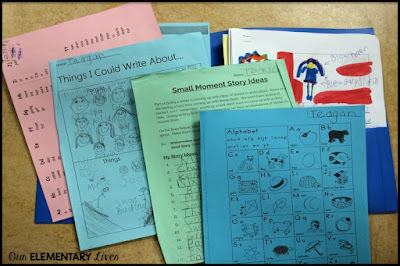 Try to come up with themed celebrations: wear berets for your poetry share, have name tags "I'm an expert in..." for information books, have a writing museum, juice toasts, include your buddies, the more awesome the better! 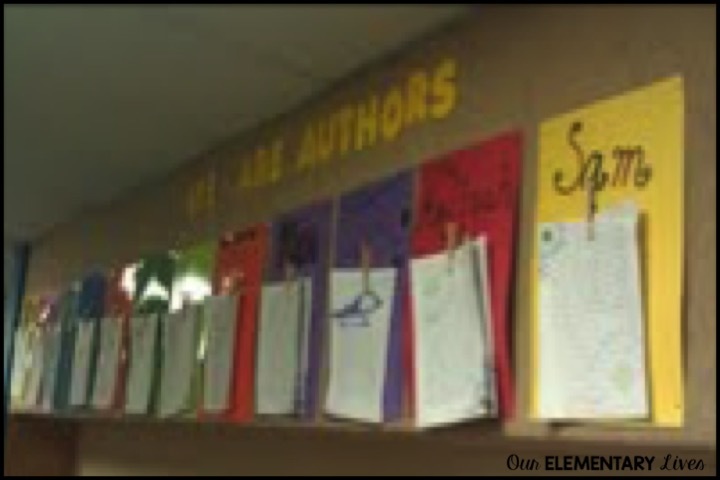 Make sure to display their work and teach them how to take pride in their writing as well. This is outside our classroom. They decorate a piece of construction paper, I hot glue a clothespin and there you go. An ever changing writing display. So there you go! 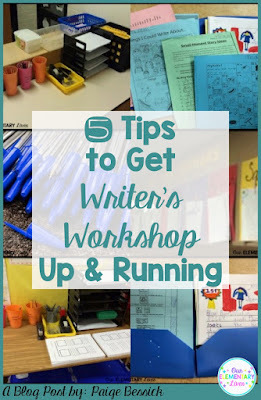 6 tips to get writer's workshop up and running in your classroom. As with anything you teach, the more excited you are, the more excited your students will be. Play it up and make writing their favorite time of the day. Here are some of my favorite tools for writing. Three things you definitely need to check out! 1. The repositionable glue stick. Have you heard of this? It makes any piece of paper a sticky note. This is how I make my anchor charts. I write/draw each key skill on paper, then use this stuff and BAM, I'm ready to make an anchor chart with my kids. 2. The Smarter Charts book by Kristi Mraz is awesome. She was my staff developer the first time I went to TCRWP and she's phenomenal. So is this book! 3. That stapler! I have 3 in my classroom because they are so awesome. You can literally use one finger to staple a whole booklet (up to 20 pages). And I have had them forever. No more broken staplers and it's easy for the kids to use too. Don't forget to pin and share so others can get these great tips too! I hope you enjoyed these tips! Until next time, happy writing. Remember to Stay Positive & Be Kind! This post contains affiliate links for Amazon. By purchasing an item on the Amazon site using these links, I will receive a small commission on your purchase.